Includes: Body, 2 x batteries & 2 x 32GB memory cards. Features: Canons flagship APS-C camera with great build quality, speed of operation, ergonomics and image quality. 18Mp CMOS sensor with formidable high ISO capabilities. Application: Crop sensor gives you a little extra focal length on your lenses. Reliable camera for less than its full frame counterparts. 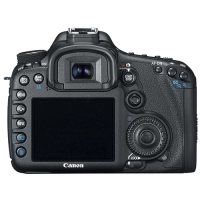 Canon EOS 7D hire from Cam-A-Lot Rentals. The 7D has an APS-C sensor which gives a 1.6 times crop. This can be very useful to get a little extra zoom out of your lenses when doing long range work. It uses the canon EF mount. It includes a built in flash. If you want a little more flash power you can add a speedlite to the hotshoe. The camera has 18 megapixels. The camera can record in full 1920×1080 HD. Have a look at our lens rental options to accompany this kit.